On my first trip to Dharamsala, the Indian home of Tibet's exiled leaders, a fellow backpacker urged me to read The Tao of Physics.4 Its mystical hybrid of scientific findings and Eastern teachings sounded dull. Back then, I preferred taking drugs to blow my mind. Who cared if what the Buddha may have said could be compared to quantum theory? As it happened, a group of people down the road: the Dalai Lama had just hosted a conference on this theme with foreign scientists. Their exchange began 10 years earlier, with the inaugural gathering of the Mind & Life Institute.5 Last year marked the thirtieth. Although these discussions are often intriguing, they appear inconclusive; more like interfaith dialogue than conversion either way. Nonetheless, they have helped spur research on how meditation works, and on the ways it changes brains. This fundamental difference has dogged proceedings ever since. In 2005, 544 brain researchers signed a petition urging the Society for Neuroscience to disinvite the Dalai Lama from its annual meeting. "We'll be talking about cells and molecules," objected Jianguo Gu at the University of Florida, "and he's going to talk about something that isn't there. "25 In response, one of Mind & Life's translators, Alan Wallace, called the petitioners "zealots" and emphasised many had Chinese ancestry.26 The Dalai Lama "has said time and again that he would reject the Buddhist assertion of reincarnation if positive scientific evidence is produced that refutes it," Wallace protested. "Are mainstream scientists equally empirical and rational, allowing them to give a fair hearing to evidence and reasoning that are inconsistent with their materialistic assumptions?" At Mind & Life events, at least, they hold their tongues. This outlook has led to a focus on cognitive science, as ways to scan brains get more revealing. Of course, scoffs Samuel: "no amount of brain-scanning of meditating yogis will either prove or disprove Madhyamika philosophy"; or whether the Buddha foretold relativity, quantum physics or Big Bang theory.33 Neuroimaging spawns papers in journals and wide-eyed reporting, as when Matthieu Ricard, a French Buddhist monk, was dubbed "the happiest man in the world" on account of activity observed in his left prefrontal cortex.34 Ricard thought this "flattering", an interviewer wrote, "given the tiny percentage of the global population who have had their brain patterns monitored by the same state-of-the-art technology. "35 The title stuck. It remains unclear what such things teach us. Not all Buddhists meditate, but some have done so for more than 2,000 years. Others have compiled extensive texts on theory. Something must have occurred behind their eyes, and it seems less arcane when displayed on screens. However, as the philosopher Jay Garfield notes: "Despite all of the glitzy powerpoints and breathless rhetoric" from fellow Mind & Life participants, "neuroimaging results are much ado about what we all should have known already. "36 Basically, "pictures show that the brain does something when the mind does something. "37 Similarly, publishing: "Neural correlates of the LSD experience revealed by multimodal neuroimaging" cannot communicate what acid feels like.38 The Guardian said: "lots of orange," referring to snapshots of the scans.39 Even if science were to map every state known to expert meditators, we would still need to practice ourselves, unless someone made drugs that induced the effects, which may include many not seen by a scanner. Another source of confusion is internal. As Garfield reminds us, brains have filters, and a lot of what they do is unconscious.40 "At a more fundamental level - the deeper, non-introspectible level," he writes, "information is cognitively available" but "actively suppressed before reaching surface consciousness." Hence, even the most skilled meditators cannot perceive unfiltered truth, such as gaps in our vision that the brain fills in. "If the doors of perception were cleansed," mused William Blake, "every thing would appear to man as it is, infinite. "41 Yet to dwell in that state might have drawbacks. It could be hard to do ordinary tasks if we "see a World in a Grain of Sand / And a Heaven in a Wild Flower. 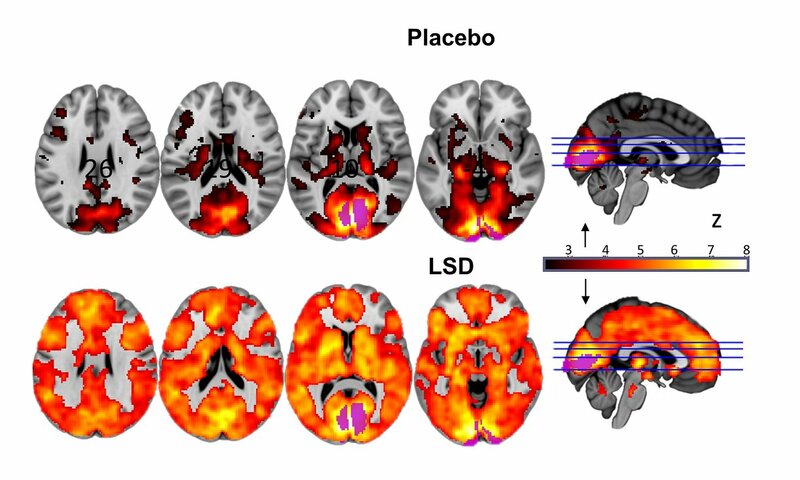 "42 Hallucinogens can feel overwhelming; the orange in LSD scans means more parts of the brain do visual processing, though this is often a dream-like "seeing with eyes-shut".43 Although the mind senses more stimulation, cortical activity drops and other networks show "decreased connectivity", correlating to "ego-dissolution" and "altered meaning".44 Direct perception can be both misleading and enlightening. Or as a tripping Dutch hippie once told me: "Life is an illusion, choose a nice one." Until comparatively recently, academics engaged with meditation based on texts, as opposed to experience, making it harder for scientists to grasp technical subtleties. This has changed with more scholar-practitioners and the emergence of fields addressing neuroplasticity (the ways that brains can be reshaped). Davidson and many of his colleagues are long-term meditators, yet they still feel constrained, afraid of sounding New Age. "Neuroscientists want to preserve both the substance and the image of rigour in their approach," explains Jonathan Cohen, another Mind & Life contributor, "so one doesn't want to be seen as whisking out into the la-la land of studying consciousness. "68 Davidson speaks of "the conservatism and stasis of the academy", which Buddhists are eroding by drawing attention to the longer-term changes in accomplished practitioners.69 "You've helped us to focus on plasticity," Davidson told the Dalai Lama at last year's Mind & Life meeting.70 "You've shown us for example the importance of warm-heartedness," which "scientists will take away from their time here and will begin to think about how it can get translated into their own work." Some critics are less than impressed by the West's translation of Eastern teachings. "Mindfulness in Buddhist tradition is to transform one's sense of self," stresses Ron Purser, who lampoons the "McMindfulness" taught as glorified self-help.71 "It's not about attaining personal goals attached to personal desires; the goal is to liberate oneself from greed, ill will and delusion, not to achieve stress reduction." Meditation might improve concentration skills, but does it root out the causes of suffering without an awareness of interconnectedness, and other components of "right-view"?72 It seems not from the pre-deployment training of U.S. combat troops in mindfulness: no outbreaks of non-violence have been reported from the battlefield. What might be studied to foster "warm-heartedness"? Part of the purpose of scanning skilled meditators has been to map the "neural correlates" of compassion and other beneficial states. This could assist with reverse-engineering "Buddha's Brain", to cite the title of a paper by Davidson's team.73 We can hardwire happiness, argues Rick Hanson, an author of books on how to do this. "By knowing with increasing clarity and specificity something about what's going on in the brain when someone is in a positive or wholesome or even exalted state of mind," Hanson says, "we can use the power of the mind alone to stimulate the neural substrates underlying those wholesome states of mind and thereby strengthen them," through repeated engagement.74 Practice might still be required, but incentives are clearer; albeit unrelated to the First Noble Truth, which says that striving for happiness keeps us stuck in disappointment. As Lopez concludes: "If an ancient religion like Buddhism has anything to offer science, it is not in the facile confirmation of its findings. "91 Its contribution is a challenge: "to understand oneself, and the world, as merely a process, an extraordinary process of cause and effect, operating without an essence, yet seeing the salvation of others, who also do not exist, as the highest form of human endeavour. "92 As in The Matrix, "there's a difference between knowing the path and walking the path. "93 If meditation bores you, try LSD, counsels the neuroscientist Marc Lewis.94 "We are literally small-minded most of the time," he observes, but people "turn to psychedelics to wake us up to the possibilities of a universal perspective," and the "meaning hidden behind the transitory stupidity of human strivings that lead nowhere." However one attains it, the only proof of experiential insight is what one makes of it. UPDATE: Alan Wallace has responded; our exchange is uploaded here.